Note: The images in this review are taken from various sources. They are simply for aesthetic purposes and do not represent the Blu-Ray's image quality. Watching the films of Buster Keaton in Kino's Buster Keaton Collection (or The Ultimate Buster Keaton Collection, according to retailers online) is frequently like glimpsing into the future. 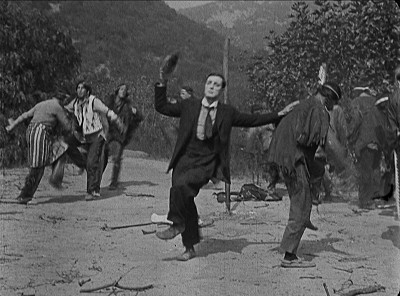 Although scholars who offer commentary in the set's extensive extra features note that Keaton was more of a cult figure or acquired taste in his era compared to mega-star Charlie Chaplin or even fellow stunt-comic performer Harold Lloyd, the list of comedians and comedies that have obviously taken their cues from Keaton is long and wide, ranging from Woody Allen to Jackie Chan, and from The Naked Gun to "The Simpsons." Viewed today, these films indicate that his reputation and influence have grown farther and wider than anyone at the time could've possibly predicted in the 96 years since he first appeared on screen. The box set offers ten features produced independently of the studios by Keaton and his collaborators, as well as his first starring role, and two collections of short films bookending the features, spread across 14 discs. Keaton also made a series of films at MGM that are not included here, but Keaton was notoriously unsatisfied with the work he did under the studio's increasingly watchful eye (the most respected of his films not included here is The Cameraman, which is available in TCM Archives' Buster Keaton Collection). Viewed in semi-chronological order (The Saphead and Three Ages lose their place watching the set in order), they vividly illustrate not just a comedian, but a filmmaker striving to grow and innovate with each progressive work. 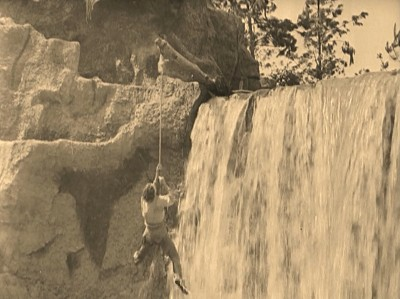 Keaton started out as co-star to Roscoe "Fatty" Arbuckle in a string of successful shorts, and he moved into the lead role when Arbuckle moved to features. For those looking for pure comic invention, the Short Films Collection showcases Keaton at his most furiously inventive. With the help of co-directors Eddie Cline and Malcolm St. Clair, Keaton dives headlong into physical comedy that frequently indulges his inner engineer (One Week's spinning walls, The Electric House's reloading billiards table, self-cleaning pool, and a literal gravy train). The Scarecrow, easily one of the best shorts of the bunch, hits all of the notes. First, Keaton and frequent co-star Joe Roberts convert their one-room house from bedroom to kitchen to dining room to living room, without moving a single piece of furniture. Then, the mood shifts to romance, with Keaton and Roberts trying to win the heart of the same girl (Sybil Seely), leading to a fantastic chase in which Buster is pursued by a seemingly bloodthirsty dog. Through it all, he lives up his nickname "The Great Stone Face," punctuated by his emotionless adieu when the dog finally corners him. By the time Keaton moved onto features, he naturally moved away from the furious, five-jokes-a-minute pace of his shorts and focused more on telling a story. Although The Saphead is not a true Keaton production (just a film he was cast in), it makes for a nice segue into his own films, with more focus on the characters and story than physical comedy (not to mention Keaton gives a great, measured performance in it). Our Hospitality, the first of his own feature productions, can occasionally feel like an extended short (albeit with a more elaborate setup, in the form of a long-running feud between two families), but even it manages to imbue the idea of the girl (in this case, Natalie Talmadge) as "happily ever after" with more emotional weight than the shorts. Jumping ahead, Keaton's features were consistently solid: Three Ages offers an ambitious triptych of romantic stories set in different eras, including stop-motion dinosaurs (!) and an incredibly fake lion costume; The Navigator serves up some underwater Keaton in a story which strands Keaton and the apple of his eye (Kathryn McGuire) on a drifting ocean liner; and Go West, in which Keaton's leading lady is not actually a woman, but a cow that follows the would-be rancher around. Many of these draw on the elements Keaton included in the shorts: a desire to use setting as a crucial element of comedy (most evidenced in the short Day Dreams, which unfortunately is mostly lost), his love of boats and trains, and his ability to wrangle large crowds and his comic skill with animals (there are about as many cows in the finale of Go West as there are cops in the end of Cops, and Buster's chemistry with his beloved cow is excellent). On top of Keaton defining his own process, there's Seven Chances, which practically foreshadows the entire romantic comedy genre: an irresistible hook, unfortunate miscommunication between man and woman, an epic series of obstacles between the protagonist and true love, and a last-minute rush to a chapel. Frankly, the story feels so contemporary, it's hard to believe it took Hollywood so long to remake it, and that it's only been remade once. Five of his features represent the cream of the crop. Sherlock Jr. only runs 45 minutes, but may be his best movie. In it, he plays a movie theater employee who dreams of being a detective, only to have a crime (a stolen watch) pinned on him while he is investigating. Returning to the theater, he sits in the projection booth, and one of Keaton's most marvelous sequences begins: a dream in which Keaton steps out of his body and physically interacts with the images on the silver screen. Much like The Play House, the technical precision in this scene is incredible, the inventiveness is off the chart, but above all, it's just plain entertaining, full of the wit and charm that the term "movie magic" was made for. The film doesn't stop there, segueing into a fantasy in which Keaton is the detective of his dreams, complete with hysterical pool-playing antics (all of which Keaton practiced until he could perform them for real), an extended gag on a driver-less bicycle (again, all real), and a couple of stunts stolen from Keaton's circus and magic days that will leave even modern audiences gasping and scratching their heads in disbelief (yes, real as well). I was also quite partial to College and Battling Butler, both of which find Buster in a sporting mood. The former has him playing a brainiac trying his hand at athletics when his sweetheart (Anne Cornwall) finds his accidental intellectual snobbery to be off-putting. A small-scale production following the financial failure of one of Keaton's most expensive movies (more on that in a second), College proves that simplicity has its benefits; there's a spectacular rowing race punctuated by a perfect physical sight gag, and the predictability of the comedic climax a) doesn't make it any less funny, and b) is trumped by the unpredictability of the very end. Battling Butler, meanwhile, focuses on one sport: boxing. Alfred Butler, a wealthy young man taking a "man up" hunting vacation in the woods, meets a young lady (Sally O'Neil) he'd like to marry, but her father and brother (Walter James, Budd Fine) think he's a weakling. Alfred's valet (Snitz Edwards), trying to help out his boss, convinces them he's "Battling" Butler, a championship boxer, leading to a charade in which Alfred must pose as "Battling" Butler while keeping the young lady or the real "Battling" Butler and his wife from giving up the game. In addition to one of Keaton's sweeter, more compelling romances and some fun training comedy, the film is a nice change of pace for Keaton in terms of his character, and it builds to a legitimately rousing boxing finish. Of course, the set is completed by two of Keaton's most famous films, The General and Steamboat Bill, Jr., which perfectly encapsulate Keaton's work. Given his love of trains and boats, it only makes sense that the two films are set around one of each. Although both contain the romances and familiar aspects of his comic persona, both go the farthest in realizing Keaton's dream of big movies, with scope and scale. The General, set during the Civil War, concludes with a full-scale battle between the South and the North (part of me wonders if modern audiences will struggle with a protagonist fighting for the South, but Keaton's loyalty lies more with the history of the actual General and its part in the Great Locomotive Chase). 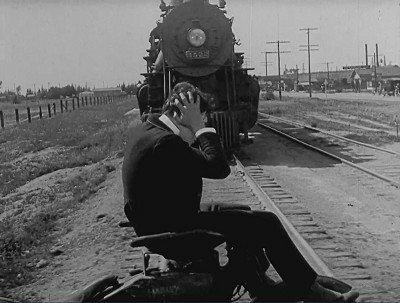 The budget of The General (which reportedly spun far out of control) is spread throughout the entire movie, which basically consists of two long train chase sequences, complete with burning boxcars, torn-down telephone lines, short stops, and a spectacular crash sequence of a locomotive driving across a collapsing bridge. Steamboat Bill Jr., on the other hand, saves the best for last, both in terms of the box set and in terms of the film: the film ends with what is arguably the most ambitious sequence in Keaton's career, and what is simply of the most ambitious practical stunt sequences ever put on film, in the form of a giant hurricane that tears apart a small town while Keaton is still in it. 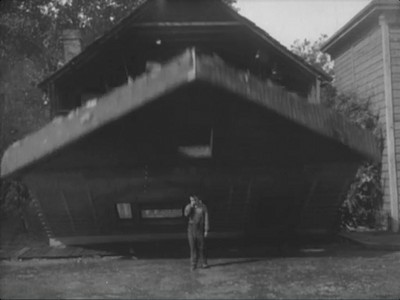 The iconic gag in which Keaton stands in front of building which is collapsing, only to be standing safely within the frame of an open window is only the midway point; Keaton dodges houses big and small, climbing over and under beds, fences, and other debris in an attempt to find safety (even appearing to defy gravity a few times as he slips and slides on the muddy ground), before grabbing onto a tree and being carried off. It's an incredible achievement, technically and comedically, even by today's standards, one can only imagine how shocking it was for audiences in 1928. 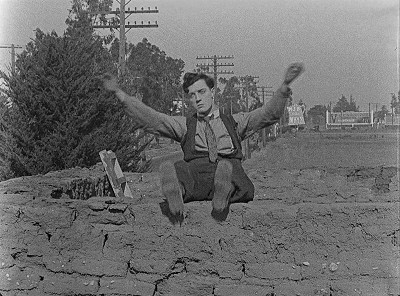 Across these 14 discs, the legacy of Buster Keaton comes into sharp focus. Although many will remember him as a talented silent comedy star, to think of Keaton only in terms of his physical gags and impenetrable straight face is to sell his talents short. Watching the box set, it's clear that Keaton was no less than a born filmmaker, blending comedy with heartfelt romance, thrilling suspense, compelling drama, and endless innovation. His impact on comedy can be felt even now, just shy of the 100th anniversary of his debut, and he and his films stand among some of the greatest in motion picture history. Kino's Buster Keaton Collection consists of four multi-disc, non-eco Vortex cases in a thin slipbox. The four cases (or Volumes) each contain at least four films (or at least three discs) apiece. Volume 1 contains the three-disc Buster Keaton Short Films Collection and The Saphead; Volume 2 contains Our Hospitality, Sherlock Jr. / Three Ages, The Navigator, and Seven Chances; Volume 3 contains Go West / Battling Butler, The General, and College; and Volume 4 contains Steamboat Bill, Jr. and the two-disc Lost Keaton set. Volume 1 also contains a booklet that goes with the Short Films Collection with notes on the films by Jeffrey Vance. Personally, I find the outer box to be a little flimsy (although the review copy arrived in poor shape), but the inner Blu cases are nice enough to put on the shelf by themselves. Note for those who have already purchased a Keaton Kino disc: all 14 discs in the box set are (or, in the case of College, will be) available individually, and the individuals and box set copies are identical, right down to the disc artwork. I also notice that the Volumes do not have individual UPCs, so although they seem perfect for individual sale, there's no indication that's on the horizon (although Kino could always create slipcovers with UPCs in the future). In terms of restoration, Kino's approach is to leave the material alone. A glance at any one of the shorts or features in the box should make it clear that removal of scratches, nicks, and other types of damage to the image would require altering or correcting over half of the frame in many cases, which would likely compromise the integrity of whatever comes out the other side. That said, these are generally in great shape for films that are nearing their 100th anniversary, and the level of detail and clarity on these Blu-Ray versions is often remarkable. For a few of the shorts, a "cleaned up" version is also presented as a bonus, but glancing at one after the other, it was hard to see much of a difference -- there's still a fair amount of damage, wear, and age that the automated scratch-removal system can't clean up. I only have a couple of nitpicks: when intertitles are too damaged or simply missing from the prints in question, Kino has created new intertitles, but these are inserted as still frames, which are visibly immobile and thus slightly distracting (perhaps some fake grain, to give the illusion of motion, would lessen the distraction); and on a handful of the shorts with replacement intertitles, there seem to be a higher rate of exposition and dialogue (more intertitles) than there are on the better-preserved shorts, which suggests slightly overzealous modern authors. All of the films, with the exception of the sound-era Lost Keaton shorts, are presented with soundtracks by a number of composers, generally recorded or written between the 1990s and the present. Of the composers, Israel's jaunty, fast-paced piano work is the best; some of the other music was recorded using an simulated organ and has a slightly electronic feel, and a few of the short film scores feature overly blatant musical sound effects, which stand out in comparison to the other tracks. 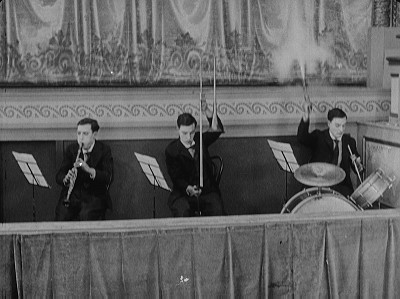 Several of the films also include supplementary music tracks by other composers (including a number of piano scores produced by Keaton film preservationist Raymond Rohauer). Given the range at which the picture quality varies between each film -- really, each shot -- and the consistency of the newly-recorded HD soundtracks, there's not much use in breaking down each film on an individual level. The limits of these presentations should be no surprise to anyone, and regardless of the limitations, the results are visibly high-def. As previously mentioned, 13 of the 14 discs in this box set have been previously released, and the content is identical. A sampling of the extras as I made my way through the box set was quite impressive: the material Kino has produced (primarily video essays, although some commentaries have also been recorded) is generally short, but very informative and extremely interesting. For a full rundown of the content in the discs currently available, here are the reviews in the DVDTalk archive: Buster Keaton Short Films Collection: 1920-1923, The Saphead, Our Hospitality, Sherlock, Jr. / Three Ages, The Navigator, Seven Chances, Go West / Battling Butler, The General, Steamboat Bill, Jr., Lost Keaton: Sixteen Comedy Shorts (1934-1937). However, College won't be released by itself until March 5, 2013, so a specific discussion of those extras is in order. First up is an audio commentary by film historian and Slapsticon founder Rob Farr. Farr is a decent speaker, but this particular track is more about information than insight, with Farr analyzing where Keaton was at in his career, talking about the careers of many of the supporting players, as well as discussing some other resources viewers can turn to for more of Keaton's history. Two video extras are also included: a "Tour of Filming Locations" (9:55, HD) by author John Bengston. I expected an actual tour of filming locations as they are today, which, frankly, doesn't sound that interesting, but this is in the vein of the other slideshow-style extras on these Blu-Ray discs, comprised of historical photographs, a couple of modern photographs, and voice-over by Bengston. It's actually quite interesting to see vintage photographs of the shooting locations as they were, and so I liked this extra much more than I thought I would. Bengston even points out a tiny tie between Keaton and "Community" -- who knew? The disc rounds out with "The Scribe" (29:29, HD), a 1966 industrial short featuring Buster Keaton's final filmed performance. Although there is a part of me that got a little queasy with the idea of 70-year-old Keaton doing physical comedy again (both out of natural concern, and also out of a "is this more sad than funny?" kind of concern), but this is actually a reasonably charming little video in which Keaton runs around a construction site trying to get people to follow the 16 rules of safety. His clothes are too baggy, some body doubles are glaringly obvious, and the short can't seem to decide whether it's just Keaton or everyone who ought to be silent, but this is actually a nice little find and should be great fun for fans. Hard to imagine anyone working on an instructional video today getting the artistic freedom to do this kind of thing, much less executing it with as much fondness for a subject and their work. Anyone who thinks they might even have a passing interest in Buster Keaton, silent comedy, silent film, or just comedy, period, should consider picking up this indispensable Blu-Ray box set. Although the $300 price tag may make your wallet groan, I've already seen the box selling for half that price, and with the individuals generally retailing for over $20 apiece, the box still represents a significant discount and an even more significant space-saver. The sheer amount of classic comedy content and a mountain of extras make this no less than an encyclopedia of Keaton's career. DVDTalk Collector's Series.